The XLBikebox.com is the perfect solution for shipping large Zinn bicycles, tandems, recumbent and all large mountain bikes with 26 inch, 27.5 inch, or 29 inch wheels. The container is constructed of high quality double double-wall corrugate and has two steel support mounts, straps to secure the bike in the box, and a fork mount with Quick release AND through axle adapters (15mm and 20mm). This box is very durable and reusable. Unlike hard plastic cases, the XL Bikebox does not transfer shock to the bicycle, but absorbs the impacts, preventing damage to carbon fiber and alloy components. 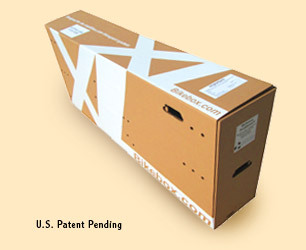 The XLBikebox meets all ground and air shipping requirements for UPS and FedEx. Recommended total shipping weight is 75 pounds. Made in USA. Dimensions: 72 x 14 x 32 inches or 164 dimensional inches.